For centuries, the world outside the Biome has been unlivable. Today, marks the first time anyone will attempt to leave the suffocating ecosphere. Eria is not worried because her scientist father has successfully tested the new Bio-Suit many times. It's a celebratory day until something goes horribly wrong. In the midst of tragedy, Eria uncovers a deep conspiracy in her perfect bubble. If those responsible find out what she knows, they won't stop hunting her until she takes her last breath. The 2nd novelette in the series, CHOKE, is scheduled for Fall 2012. The 3rd, EXHALE, is scheduled for Winter 2013. 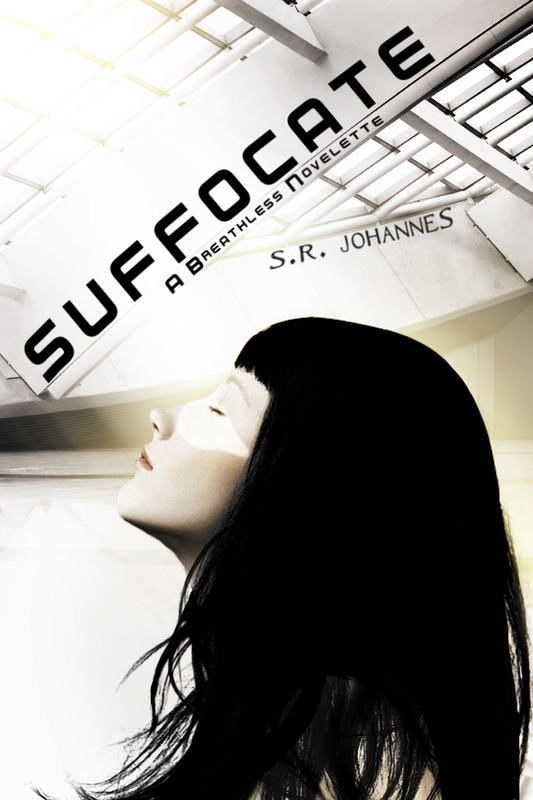 Suffocate is a fantastic and quick read! I didn't expect to feel so much from this short story and I wonder how S.R. Johannes was able to give readers so much action in such little time. The most significant aspect of Suffocate is the world building. I could not imagine living in a Biome where everything like air, clothing, and food are all genetically altered or artificial. Johannes puts much detail in the creation of the Biome, but not too much to bore readers. The Biome is boasted to be a perfect structure but there sure are many faults found within. Eria's life is centered on her father's research and his rise to fame. He's the big science guy on campus and everyone is rooting for him as he's the first person to step foot outside the Biome. What was supposed to be a safe experiment turns deadly and Eria spends most of the story investigating what went wrong with the help of her fathers assistant, Ash. I love that Suffocate takes the characters on a wild, dangerous investigation and leads Eria and Ash to hidden secrets and whole new line of suspicion. There are so many paths they could have taken and the one they chose has led them to a heart stopping ending. I won't call it a cliff-hanger because readers aren't stopped right in the middle of a tense scene, but Suffocate does end thought-provokingly with a big bang.